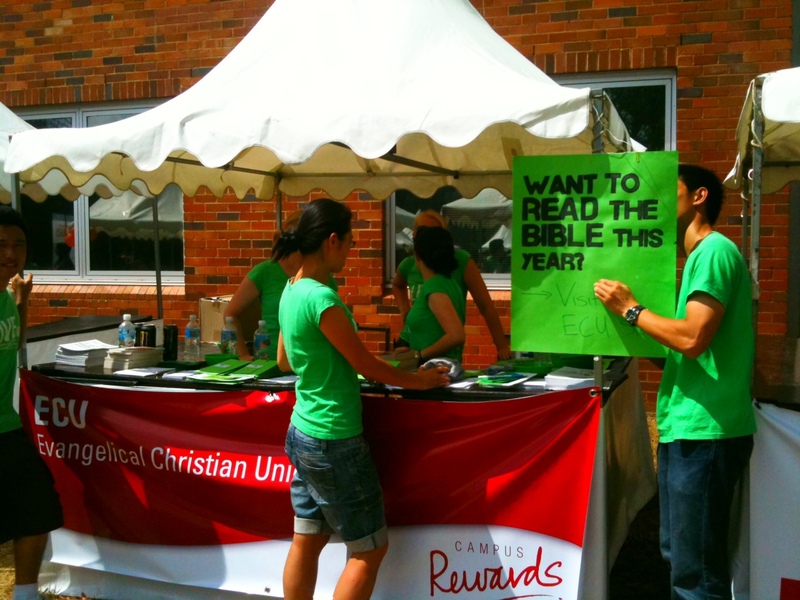 Campus Ministry: Going Green, Growing Up. Before I ran away to seek adventure upon the high seas of theological study, I was a campus staff worker for AFES (the Australian Fellowship of Evangelical Students). In fact, if you delve far enough back into the archives of this blog, you’ll find articles and newsletters I wrote back in those dim and misty times. I was appointed to serve the students at the University of Canberra when the regular staff-worker was translated to Moore College to teach New Testament Greek. It was just a one year gig, but I was blessed and trained and better prepared for my studies through the experience. The ministry here at Cumbo is structurally very similar to the one I was involved with in Canberra. It revolves around a programme of Lunchtime Bible teaching (Tuesday 12pm); an evening leadership training time (Prepared to Serve); small group Bible studies; and regular one-to-one (1-2-1) mentoring of students. My particular responsibility is for the training and mentoring of the male students on the campus, and I’ve already got a crop of 9 guys to meet up with regularly each week. After my initial 1-2-1 meeting with a student, I had two immediate impressions: first, the guys here are keen to learn and serve. It’s awkward when you sit down together to try and build a mentoring relationship from scratch, but these guys know what the goal is: training in christian maturity. And they’re keen to get to that goal, so the awkwardness is worth it. Obviously, these are the mature Bible study leaders, but this hunger for biblical discipline strikes me as a wonderful testimony to the work already done on the campus. Secondly, I’m struck by how much I’ve changed over the past five years. Compared to my last attempt at campus ministry, I began today with a far sharper understanding of the purpose of these mentoring relationships, and a stronger strategy for how to train and encourage the guys. I’m clearer on the pattern of sound doctrine, I’ve a better mental image of the likeness of Christ toward which we strive with the Spirit’s help. I’m not as timid. This older and wiser self isn’t something I can claim any credit for. It’s a product of the patience and persuasiveness of God at work in my life over these years, through his word, through the patience and persuasiveness of brothers and sisters in the faith. It is a joy to grow older in the Lord! Previous Post The Friendship Hinge. This is so great to hear, brother! You've fired me up for my day of doing much the same (although any tips on this 'stronger strategy for how to train and encourage the guys' would be gratefully accepted).